Digging into the Strategy One survey results, it seems Miami is a hotbed of mobile misfortune, with 52 percent of those surveyed reporting a lost or stolen smartphone during their lifetime. Following close behind are New York and Los Angeles with 49 percent and 44 percent respectively, proving major metropolitan areas are no slouch when it comes to smartphone skullduggery. While Norton published the study as part of a product release, the numbers are a stark reminder that modern smartphones are packed with sensitive data that make them prime targets for identity thieves. Worse, more than half of those surveyed did not secure their smartphone with a password, and nearly ninety percent did not install a security app capable of remotely locating, locking or wiping their smartphone in case of theft. Norton Mobile Security 1.5 in action. 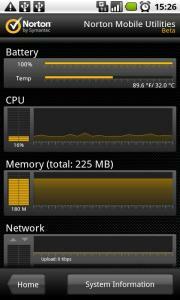 Norton Mobile Utilities is an all-purpose Android app. If it’s too much hassle to seek out and install your own mobile security solutions, Norton has expanded their stable of retail partnerships across the globe to include Best Buy Canada, European retailer Dixons Retail, Kingston Digital and the Brazilian ISP UOL Inc. Such partnerships make it simple for consumers to install Norton software on their devices, but smart users know the same security tricks we’ve been using on our desktops for decades are equally appropriate for smartphones: keep your security software up to date, don’t click through unsolicited or salacious links, and change your password regularly.